SIS 111101 GOST 5639-82. Determine feritic and austerritic grain size in steel. The available methods are: 1. Automatic lineal heyn intercept method.2. Jeffries planimetric method. 3. Automatic and Semiautomatic Snyder and graff open scale intercept method. 4. Comparison method. 5. ALA grain size. 6. Selected grain size. 7. Manual count etc. statistical data (area) will be accumulated in the class table. group A, b,C,D along with segmentation of thick/thin and its severity level. ASTM E1077, ISO 3887, JIS-0557-98 BS-6617,IS-7754 DIN 50192. Lamellar Graphite module is simple and straight forward. You need only to describe the sample and taken and the image of the sample rest is supported by powerful and complex image analysis algorithms. This modules evaluate and quantity in a fully automatic and consistent way FORM (Designated by roman no l to Val), size (Designated by Arabic no 1 to8) & type A to Either Graphite is determined at a magnification of 100 and recommended area size is 80mm.Result and images may be displayed and stored in either the industry standards Microsoft access database, where search facility can quickly find the results of a particular analysis using unique information such as customer, specimen type, data, operator etc. Pores in casting are estimated and reported on the basis of intensity. The percentage is calculated. Spheroidal Graphite (Nodules) in cast iron are analysed by identifying the appropriate industry standards. The software determines proportion of graphite of non-round shape, for instance vermicular graphite. Nodules for (designated by Arabic no 1to 8) is reported along with calculated Nodules/sqmm.Artifact can be recognized and ignored. 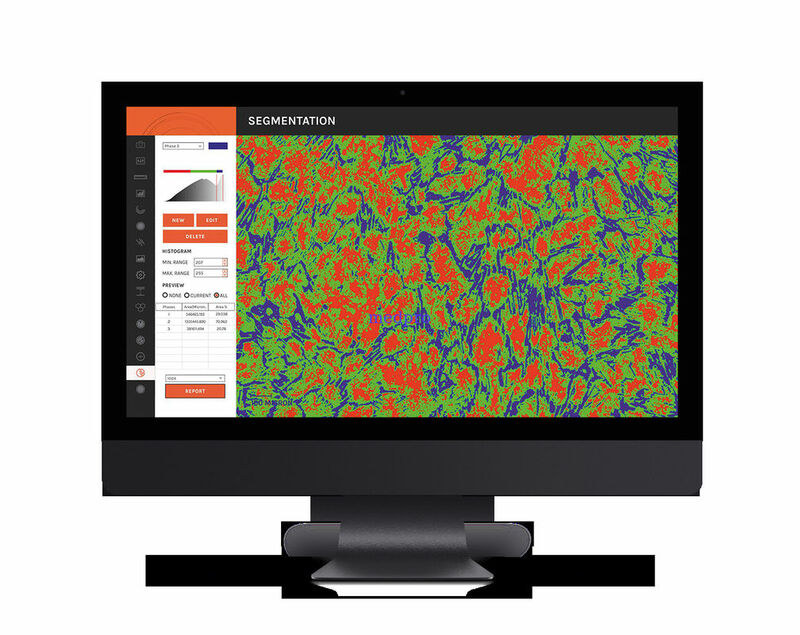 Following graphite measurement and classification, the software presents the result in both graphical and statistical formats. The full morphological analysis raw data is also displayed. Result and images may be displayed and stored in either the industry standard Microsoft access database format, or in an integrated database along with unique information such as customer, specimen type, data, operator etc. The test method covers measurement of the local thickness of metal and oxide coatings by microscopical examination of cross section.